Within the technology transfer field, there have been numerous empirical studies taking US data and context that have examined the impact and effect of government legislation aimed at supporting effective technology transfer, particularly from universities and federal research laboratories to the market. However, there is a paucity of such studies in other geographical domains. 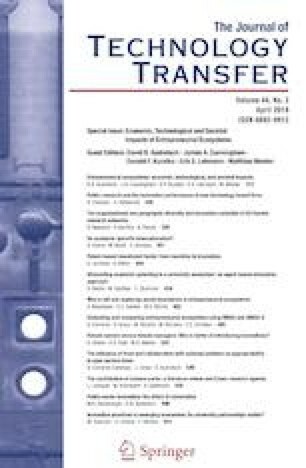 Existing studies have further not focused on examining the simultaneous effects on entrepreneurial and innovative outcomes of university focused technology transfer policies. We address these research gaps by examining the effects of a far-reaching legislation change in Germany, reforming the old ‘professor’s privilege’ (Hochschullehrerprivileg). The purpose of this paper is to investigate whether regional entrepreneurial and innovative outcomes have been affected by this legislative change in intellectual property rights of inventions made by scientists. Our results suggest that this legislative change did have an initial positive effect on universities as measured by start-ups and patents. The effect yet changed over time, leading to some unintended consequences. Our paper argues that policy makers and legislators need to give consideration to the replication of policy and legislative instruments from other contexts along with the criteria that are used to measure success. Cuntz, A., Dauchert, H., Meurer, P., & Philipps, A. (2012). Hochschulpatente zehn Jahre nach Abschaffung des Hochschullehrerprivilegs. In Studien zum deutschen Innovationssystem 13-2012, Expertenkommission Forschung und Innovation (EFI)—Commission of Experts for Research and Innovation. Berlin. http://EconPapers.repec.org/RePEc:zbw:efisdi:132012.